Women gathered at the Mansions on Fifth Hotel on Wednesday to celebrate the women of World War I with afternoon tea. In the ornate halls of the Mansions on Fifth Hotel on Wednesday, a group of older women snapped photos of themselves wearing floppy pastel pink, yellow and blue hats as waiters served platters of tea cakes and cucumber sandwiches. Alternating between the main hall and the tea room, the group practiced different poses, deciding which ones made for the most elegant pictures. These ladies were attendees of the Fourth Annual Britsburgh Festival of High Teas. Anglophiles and history buffs took over the luxurious hotel for an afternoon of sipping tea and celebrating the women of World War I nearly a century after its end.Fourth Annual Britsburgh Festival took over a luxurious hotel for an afternoon of sipping tea and celebrating the women of World War I.
Mike Staresinic — a board member of Britsburgh, the organization holding the festival — felt strongly about this cause. “When you’re commemorating the end of the first world war, instead of focusing on men with cannons, we want to highlight women’s roles,” Staresinic said. Britsburgh is dedicated to celebrating cultural ties between Pittsburgh and the United Kingdom. This is its fourth annual festival of all things British, running from Sept. 4 to 9. The afternoon tea and discussion with WWI author and historian Elizabeth Williams, Ph.D, at the Mansions was one of the first events of the 2018 celebrations. Williams delved into her research about World War I by talking about her book, “Pittsburgh in World War I: Arsenal of the Allies.” Her work explores international relations during the war and Pittsburgh’s role in the conflict. 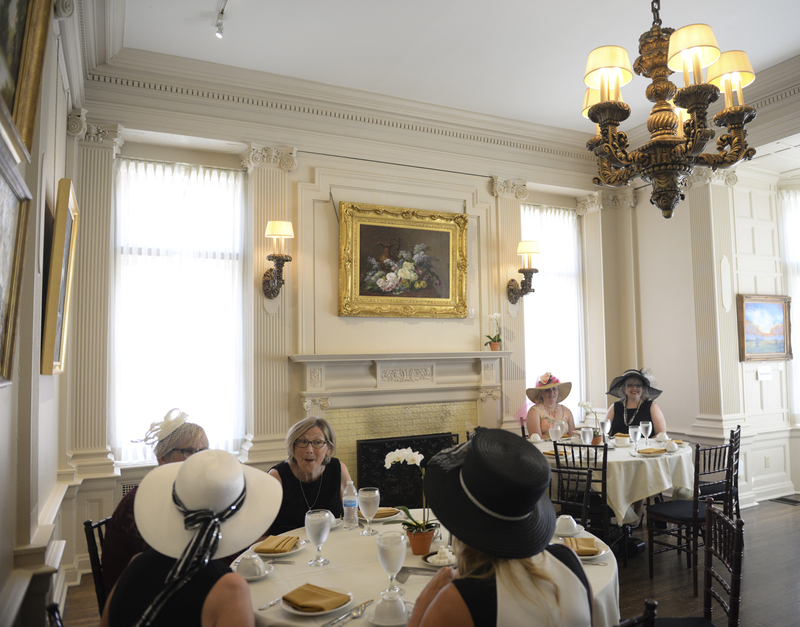 Women don elaborate hats and colorful ensembles Wednesday afternoon while attending high tea at the Fourth Annual Britsburgh Festival. The discussion mainly focused on women and women’s roles at the time. Throughout history, men have been the main focus of narratives involving war and politics, which is why events like this serve an important part in shedding light on the women in these stories. One such story Williams shared was about how women played a crucial role in providing health care and aid. Once all the women were seated and sipping from their porcelain cups, board member Robert Charlesworth passed a box of poppy flower pins around the room. The pins were colored red and green with a single black button in the center of the flower. “The poppies grow in Flanders Field and are a symbol of remembrance for the people who died in the war,” Charlesworth said. Kim Szczypinski, leader of Britsburgh’s history board, said that people tend forget about World War I more than other historical events despite the effects it had on cultural relations and women’s significant role in it. Mary Roberts Rinehart, “The American Agatha Christie,” was a key point of Williams’ presentation. As the first American to interview Queen Mary of England and Winston Churchill and the first female war correspondent to be taken into the territory between the Allied and German lines, Rinehart served as a figure of immense power and inspiration to women of that time. “She highlights the personal connections and what these people were feeling at the time,” Williams said. After Williams’ discussion, the women finished their tea cakes and quietly reflected on stories of bravery, politics and loss of life. Attendees of all backgrounds and generations sat in the space for two hours, learning and unpacking what it meant to be a woman in the time of battle while men were on the front lines. History may have painted women in an unfavorable and unfair light, but in those few moments a silent homage was paid to the women of World War I. This cause was important for Staresinic, who was proud to honor the women in this history and the resolution of it as well. “It’s so easy to get caught up in the destruction –– it’s better to focus on the relief,” he said.